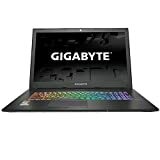 The Gigabyte SABRE 17 is a gaming laptop with GTX 1050 Ti graphics that features hybrid storage and a 7th generation Intel i7-7700HQ processor with Kaby Lake microarchitecture for ultimate speed and performance. The Gigabyte SABRE 17 utilizes the Intel Core i7-7700HQ processor featuring Kaby Lake microarchitecture for extreme performance capabilities. It’s a quad core processor with 8 threads and a robust 6 MB cache. The processor base frequency is 2.80 GHz while the max turbo frequency is a nice 3.80 GHz. The processor graphics are Intel HD Graphics 630, which offers 4K support at 60 Hz, and can support as many as 3 monitors. The SABRE 17’s dedicated graphics are NVIDIA GeForce GTX 1050 Ti, which features Pascal GPU architecture for a huge step up in graphics quality. With a 4 GB GDDR5 frame buffer, and a memory speed of 7Gbps, GTX 1050 Ti also supports NVIDIA GPU Boost 3.0 for smoother gameplay and lusher, richer graphics overall. This laptop comes packed with 16 GB DDR4 RAM for an ultimate, modern memory performance. The great thing about this is DDR4 is the current standard and features less latency than previous iterations, while the 16 GB is more than enough RAM to play the latest games. There’s an additional RAM slot if you wish to upgrade, bringing total possible RAM capacity to 32 GB. The SABRE 17 features hybrid storage, which means it has a combo of classic HDD storage with the newer SSD storage. You may be wondering what the point of hybrid storage is—especially if you’re unfamiliar with SSD. SSD storage is Solid State Storage and functions more or less like high-capacity thumb drives instead of a spinning disc that can easily fail (like HDD storage). Obviously, now that SSD storage is available, it’s the preferable option, because it means your laptop is less likely to be DOA or die a premature death for no apparent reason. Full SSD storage is expensive, though. Because it’s a newer technology, SSD storage costs a lot more per gigabyte of storage compared to HDD, so those who have only SSD storage tend to have to settle for less gigabytes of storage due to financial limitations. This is where the beauty of hybrid storage comes in. You get the safety, security and quick loading times of SSD storage while having the robust storage capacity of HDD storage. For many, this isn’t just a compromise—it’s the best of both worlds. The SABRE 17 comes with 256 GB SSD storage and 1TB of HDD storage to suit a wide array of user needs. The build of the Gigabyte SABRE allows you to attach three additional monitors—for a total of four displays—to meet your multitasking needs. This is great for social gamers or those who have a job that requires their divided attention. Another cool gamer feature is the TriDef SmartCam, which you can use in-game or while Skyping; the great thing about this gem is that you don’t need a green screen to remove/change backgrounds—great for those who host their own web shows and livestreams. X-Split Gamecaster + Broadcaster further optimizes your social gaming with social media integration and a distraction-free layout—another great feature for gaming pros to showcase their skills to their fans. Sound is enhanced via Sound Blaster Cinema 3, which uses 3D sound technology to optimize sound even in less-than-ideal acoustic settings for a rich, bold soundscape that immerses you in the game; additionally, the SABRE has HQ build-in microphones for in-game chats. The Gigabyte SABRE 17 is visually stunning, thanks to its sleek black case, slim profile and keyboard, which features customizable 16.8 million colors and patterns that allows you to make the keyboard truly yours. Usage is very ergonomic for a laptop; meanwhile, all of the bells and whistles are appreciated but don’t stick out, so you get just the right amount of use out of them. In other words, they really do maximize your gaming experience without added annoyances. The graphics are incredible and smooth. The display is spectacular and overall, gaming in general is smooth and clear, and the quality audio helps with that as well. I’m a big fan of the SABRE 17 for its overall smoothness and the hybrid storage definitely seals the deal for me since I like having the best of both worlds. With the Gigabyte SABRE 17K-KB3 you get 1-year limited US warranty and lifetime tech support. The Gigabyte SABRE 17K-KB3 provides laptop gamers with everything they need to play the latest games, including top of the line 16 GB DDR4 RAM and futureproof ability on that front, as well as the power of the i7-7700HQ processor and top-notch GTX 1050 Ti graphics. There are only two RAM slots. One comes prepacked with 16GB of RAM and the other is empty, so you have the option of adding an additional 16GB of RAM for a total of 32 GB. While this is bad news for gamers who insist on having a full 64 GB of RAM, it’s important to remember that 32 GB is sound futureproofing and many consider 64 GB overkill for normal gaming applications at this juncture. So, really, you should be good with the base option of 16 GB and since you can upgrade to 32 GB, you still have futureproofing capabilities.